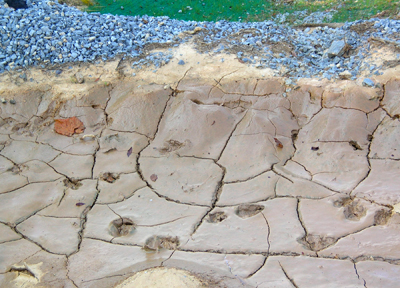 Earlier this year, I left some deep tracks in some mud on an abandoned construction site. Recently, I saw these tracks in mud and determined that a deer left them. One thing I like about living where I do is that I see lots of wildlife such as deer, wild turkeys, rabbits, foxes, coyotes, skunks, raccoons and possums. We have found possums in our backyard. One night before we officially adopted our cat Christmas, we found a baby possum sharing her food on our front porch. It was the sweetest site. The husband unknowingly has closed the garage door with the cats unwillingly hosting a possum. Luckily no attacks occured. All seem to be quite perplexed, including the husband. Let’s remember how dangerous trash can be to wildlife. 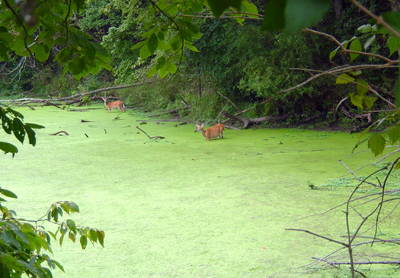 The deer are in the lake eating duckweed.